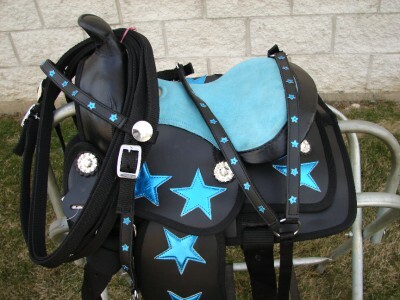 Contact us today at: TacknStuff@sbcglobal.net Please mention this BLOG and description of item you are interested in. Thank you! 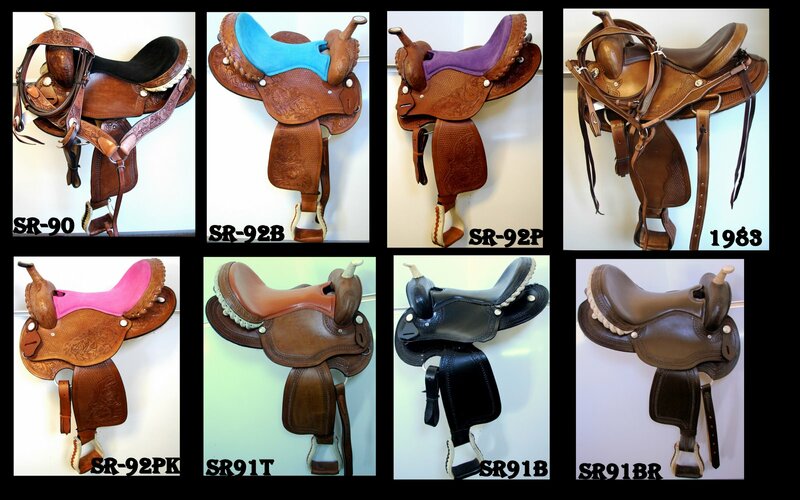 SaddlesnStuff847-428-2252 M-F 9am-3pm CST . I am Sue i will help you . these are English tan 2 tone close contact saddles with extra free tack that you see in the picture. Mention our blog while calling and get a 5% discount . 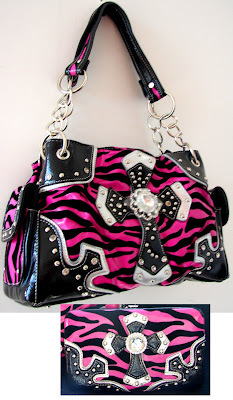 Contact us today at: TacknStuff@sbcglobal.net Please mention this BLOG and description of item you are interested in. Thank you! SaddlesnStuff847-428-2252 M-F 9am-3pm CST MY NAME IS SUE I WILL HELP YOU. 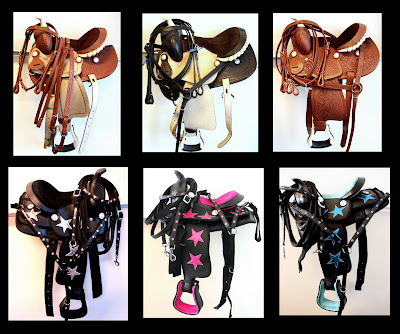 THESE COME IN 10" OR 14"
WITH EXTRA TACK - HEADSTALL , BREASTCOLLAR , REINS AND A COTTHON GIRTH. 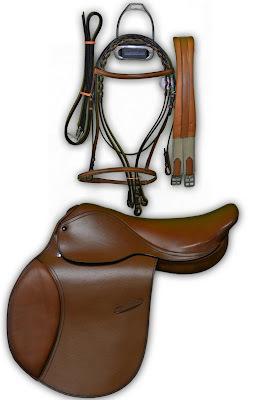 THE SADDLE COMES IN 2 COLORS A MEDIUM OIL OR A DARK OIL. THESE ARE WELL MADE RANCH ROPING SADDLES IN NATURAL LEATHER. 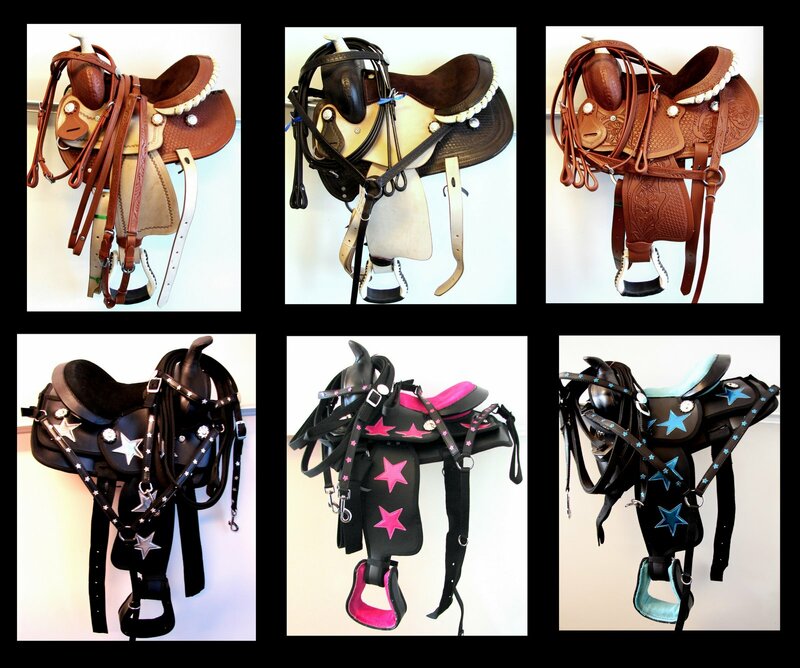 WE HAVE THEM IN 15" 16" 17" SIZE WITH HEADSTALL , BREASTPLATE AND REINS SET. Need more than 1 pair? Just ask. Call me to make a credit card payment over the phone...we will ship as soon as we recieve your secured payment. USPS will deliver within 2-3 days including Saturday delivery. Why pay more? 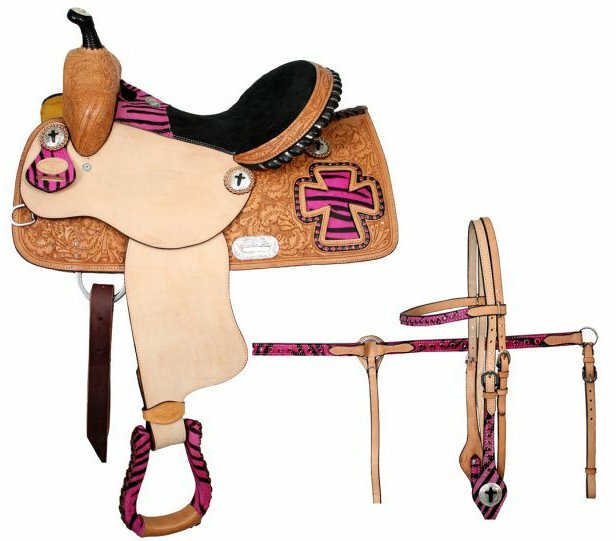 Are you selling a horse or showing? This is a good looking track halter at such an affordable price...nice break away halter..will keep your horse safe if he got caught up on a post..he will be able to break himself loose. Giving a horse as a gift??? 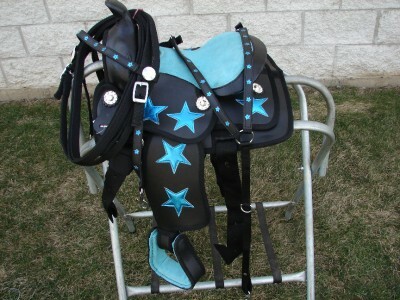 Dress the horse in one of these!!! Chafeless Girth- stretch elastic on one end 42"
Brow band is approx. 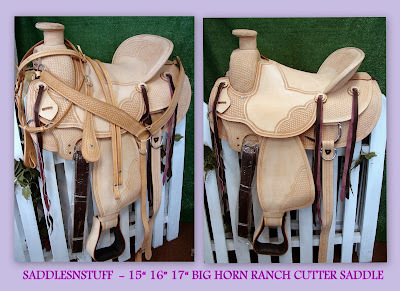 : 15"
Bit to Bit 40" on each side and adjustable smaller approx. 2-3" or larger by 1"
Nice set at an affordable price! $59.00 available for shipping or pick up in ILLINOIS. 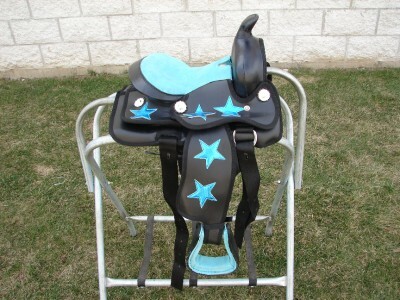 THESE ARE GOING FAST SO CALL NOW FOR YOUR SIZES...also have BAR NONE FLY MASKS for sale. Gorgeous! Bright! Adorable & Showy! FINALLY!!! WE SELL OUT OF THESE FAST EVERYTIME! 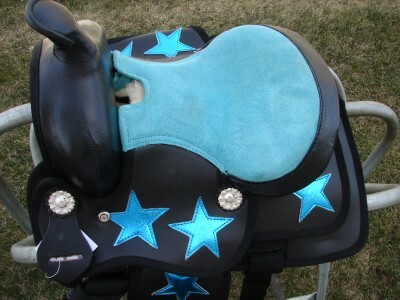 All you will need is the bit, girth,pad..
Stirrups at the longest setting 26"-29"
There are tiny shimmery stars on the breastplate also..they are sewn in with a center stitch..you may want to use an adhesive to secure them better for if this gets knocked around one or 2 may come loose. WE SHIP FAST TOO...WE WILL SHIP M-F SAME DAY WE RECEIVE YOUR PAYMENT BY 10 AM CST. We will ship by UPS in the USA, Hawaii or Alaska by USPS and will be more money. Canada & other foreign countries to the USA will be shipped by USPS Priority International. You will be responsible for any customs tax added by your country. helping Farmers, Ranchers and Breeders sell their horses! We think bringing people together is important for the future! From the Horse's Mouth-must read on boots! Therapy for Handi-capable Equestrians-T.H.E. CENTER,INC.